In partnership with our patients, we use advanced engineering techniques to understand the nervous system and restore it to health. 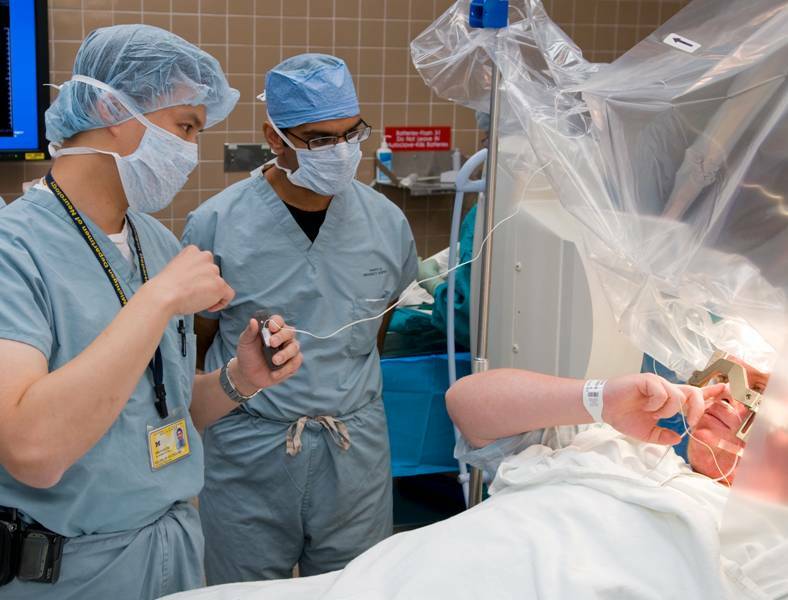 I am a clinician-scientist with longstanding interests in electrophysiology, mathematical modeling, and the development of therapies for the treatment of paralysis, movement disorders, and psychiatric conditions through the use of neural-interface devices. My PhD thesis at Johns Hopkins explored the presynaptic regulation of voltage-gated calcium channels using patch-clamp techniques and mathematical modeling. My postdoctoral research at Duke focused upon the development of brain-machine interfaces for reaching and grasping through chronic recording in non-human primates and acute intraoperative studies during DBS procedures. 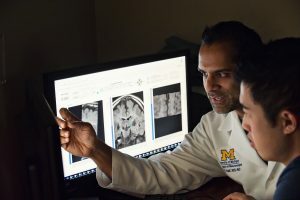 At Michigan, I am Associate Professor of Neurosurgery, Neurology, Anesthesiology, and Biomedical Engineering. My active participation in multiple departments underscores the multidisciplinary nature of my clinical and research activities. My research goal is to utilize engineering and mathematical techniques, along with interdisciplinary collaboration, to improve neuroprosthetics and neuromodulation therapies. I have been actively engaged in the development of novel clinical and translational brain-machine devices for 12 years. At Duke, I performed non-human primate surgeries, pioneered subcortical human array recordings, and developed decoding algorithms to extract movement information from sparse datasets. At Michigan, we have taken a team-science approach with Drs. Cederna, Flynn and Chestek, to develop novel electrodes, algorithms, and circuits for neuroprosthetic applications. Most recent work in the laboratory has evaluated glial scarring with COMSOL and NEURON modeling. Carmena JM, Lebedev MA, Crist RE, O’Doherty JE, Santucci DM, Dimitrov DF, Patil PG, Henriquez CS, Nicolelis MA. Learning to control a brain-machine interface for reaching and grasping by primates. PLoS biology. 2003;1(2):E42. Patil PG, Carmena JM, Nicolelis MA, Turner DA. Ensemble recordings of human subcortical neurons as a source of motor control signals for a brain-machine interface. Neurosurgery. 2004;55(1):27-35. Rhew H-G, Jeong J, Fredenburg JA, Dodani S, Patil PG, Flynn MP. A Fully Self-Contained Logarithmic Closed-Loop Deep Brain Stimulation SoC With Wireless Telemetry and Wireless Power Management. IEEE J Solid-State Circuits. 2014. 49(10):2213-27. Malaga KA, Schroeder KE, Patel PR, Irwin ZT, Thompson DE, Nicole Bentley J, Lempka SF, Chestek CA, Patil PG. Data-driven model comparing the effects of glial scarring and interface interactions on chronic neural recordings in non-human primates. Journal of Neural Engineering. 2015. 13(1):016010. Irwin Z, Thompson D, Schroeder K, Tat D, Hassani A, Bullard A, Woo S, Urbanchek M, Sachs A, Cederna P, Stacey W, Patil P, Chestek C. Enabling Low-power, Multi-modal Neural Interfaces through a Common, Low-bandwidth Feature Space. IEEE TNSRE. 2015. (in press) PMID: 26600160. A major focus of our work has been the application of neuroimaging and mathematical modeling to individualize DBS targeting. At the present time, we have completed, and are in the process of publishing, two studies that utilize high-resolution diffusion tensor magnetic resonance imaging to perform automated thalamic segmentation with finite-element activation modeling, as well as a study that builds on prior work below to automate intraoperative target verification during DBS surgery. Patil PG, Conrad EC, Aldridge JW, Chenevert TL, Chou KL. The anatomical and electrophysiological sub-thalamic nucleus visualized by 3-T magnetic resonance imaging. Neurosurgery. 2012;71(6):1089-95. Houshmand L, Cummings KS, Chou KL, Patil PG. Evaluating indirect subthalamic nucleus targeting with validated 3-tesla magnetic resonance imaging. Stereotactic and Functional Neurosurgery. 2014. 92(6): 337-45. The STIM Program has created a registry of DBS procedures and outcomes. We now have a rich database of 200 patients, together with lead locations, imaging, and clinical evaluations, that allow us to perform individualized electrical-field modeling of DBS mapped to clinical outcomes. Chou KL, Persad CC, Patil PG. Change in fatigue after bilateral subthalamic nucleus deep brain stimulation for Parkinson’s disease. Parkinsonism & Related Disorders. 2012;18(5):510-3. Chou KL, Taylor JL, Patil PG. The MDS-UPDRS tracks motor and non-motor improvement due to subtha-lamic nucleus deep brain stimulation in Parkinson disease. Parkinsonism & Related Disorders. 2013;19(11):966-9. Soileau MJ, Persad C, Taylor J, Patil PG, Chou KL. Caregiver burden in patients with Parkinson disease undergoing deep brain stimulation: an exploratory analysis. Journal of Parkinson’s Disease. 2014;4(3):517-21. With our collaborators, we have been actively involved in the development of novel stem-cell based therapies for ALS and other neurodegenerative disorders for the past five years. I have been principal neurosurgeon at Michigan in a multicenter trial for spinal transplantation of spinal cord-derived stem cells for ALS. In addition, we have been evaluating the potential for cortically derived stem cells for memory loss. Chen KS, McIntyre JC, Lieberman AP, Martens JR, Patil PG. Human spinal autografts of olfactory epitheli-al stem cells recapitulate donor site histology, maintaining proliferative and differentiation capacity many years after transplantation. Acta Neuropathologica, 131:639-40. 2016. Glass JD, Hertzberg VS, Boulis NM, Riley JP, Polak M, Bordeau J, Fournier CN, Johe K, Hazel T, Cudkowicz M, Atassi N, Borges LF, Rutkove S, Duell J, Patil PG, Goutman SA, Feldman EL. Transplantation of Spinal Cord-Derived Neural Stem Cells for ALS: Analysis of Phase 1 and 2 Trials. Neurology, 87:392-400. 2016.